Founded on the site of a miracle, this small settlement has had an outsized role in the history of Russia’s northwest. Located some 140 miles to the east of St. Petersburg, the small city of Tikhvin is today considered within the orbit of the northern megapolis, yet it existed as a northern forest settlement centuries before the founding of Peter the Great’s city on the Neva. In the medieval period, it was known as the haven for one of Russia’s most revered icons; later, at a perilous moment in late 1941, the fate of besieged Leningrad hinged on the outcome of battles for Tikhvin. The town’s name derives from the small Tikhvinka River, whose name itself is rooted in the word for “quiet” or “still.” The Tikhvinka flows in the direction of Lake Ladoga, and in the early 19th century, it formed the core of a small canal system linking St. Petersburg with the Volga River basin. The very origins of Tikhvin are founded in a miracle. It is said that in 1383, an icon with an image of the Virgin holding the Christ Child hovered near the Tikhvinka River. The form of the icon was one of the most ancient, the Hodegetria (“the one who shows the way”). In this icon, the Mother of God holds the infant Christ with one arm and points to him with the other hand. The appearance of such an ancient icon at Tikhvin was subsequently interpreted as a sign of the divine favor bestowed on Russia. In 1383, a small log church dedicated to the Dormition of the Virgin was built for the eponymous Tikhvin image on the site of its miraculous apparition. A village grew around the church, which held what would become one of the most venerated icons in Russian Orthodoxy. In more prosaic terms, the Tikhvin settlement benefited from a location on trade routes from the northeast and south that led toward the Baltic Sea via Lake Ladoga. The abundance of primitive bog iron in the nearby region of Ustiuzhna stimulated the development of metalworking in numerous smithies. Even as the settlement grew, its center remained the Dormition Church. The wooden structure was destroyed more than once by fire, yet the miraculous icon survived. The icon’s importance only increased after the fall of Constantinople in 1453, after which Moscow saw itself as the ultimate defender of the Orthodox faith. And with the subjugation of Novgorod by Moscow’s Grand Prince Ivan III, Moscow became the protector of the most sacred Tikhvin Icon. Take a regular bus from St. Petersburg bus station (Naberezhnaya Obvodnogo kanala, 36). The bus goes every 30-40 min from 7 a.m. to 9:45 p.m. Travel time: 4 hours. When the Dormition Church again burned in 1500, Grand Prince Basil III (son of Ivan III) gave funds in 1507 to rebuild the Dormition Church as a greatly enlarged masonry cathedral to protect the icon. Erected in 1510-1515 under the supervision of the Novgorod builder Dmitry Syrkov and with the support of Novgorod’s Archbishop Serapion, the Dormition Cathedral replicated the general form of the Dormition Cathedral in the Moscow Kremlin, with five cupolas and a large icon screen for the interior. Attached to the main structure was a one-story gallery that served as a narthex. In building the cathedral, Syrkov apparently had the services of one of the Italian architects active in Moscow, a certain Ivan Fryazin. The white-washed brick cathedral soared above the low wooden structures of the rest of the Tikhvin settlement. A half century later, in 1560, Basil’s son Ivan IV (the Terrible) decided to create a monastery around the cathedral. The design of the new Dormition Monastery was entrusted to Dmitry Syrkov’s son Fyodor, who resettled people living around the cathedral and cleared space for a monastic enclosure defended by a stout log wall. The monastery was intended to perform double duty as a fortification protecting the area against incursions from Sweden, north Russia’s ancient rival. The monastery’s next brick structure was the Church of the Intercession of the Virgin, built in 1581 on the south flank of the monastery with an attached 2-story refectory and capacious dining hall that has been well preserved. Adjoining the east end of the Intercession Church is a large bell gable completed in 1600 and much modified thereafter. Partially destroyed during fighting in the fall of 1941, the bell gable has been restored to what is thought to have been its original appearance. The 1590s also witnessed the reconstruction in brick of the main (Holy) gate, which was surmounted in the usual Russian monastic practice with a church. Dedicated to the Ascension, this gate church was frequently modified and much damaged during the war and has now been reconstructed to resemble its 17th century form. The beginning of the 17th century brought severe trials to Tikhvin. Following the death of Boris Godunov in 1605, Russia entered a period of destructive chaos known as the Time of Troubles. With no clear successor to the Muscovite throne, various warring factions, including Polish claimants, fanned the flames of a social conflagration that consumed much of European Russia. In 1609 attempts were made to enlist Sweden as an ally in the struggle with Poland. The alliance soon foundered, and in 1610 Sweden took advantage of the chaos to advance its commercial interests and push Russia farther from the Baltic Sea. Swedish forces led by Jacob de la Gardie seized Novgorod and then Tikhvin, but in late May 1613 the inhabitants of Tikhvin rebelled against the Swedish garrison. When a punitive detachment returned, the townspeople barricaded themselves in the Dormition Monastery, where they withstood several assaults.The heroic defense of Tikhvin in 1613 prevented further erosion of Moscow’s position in the northwest. 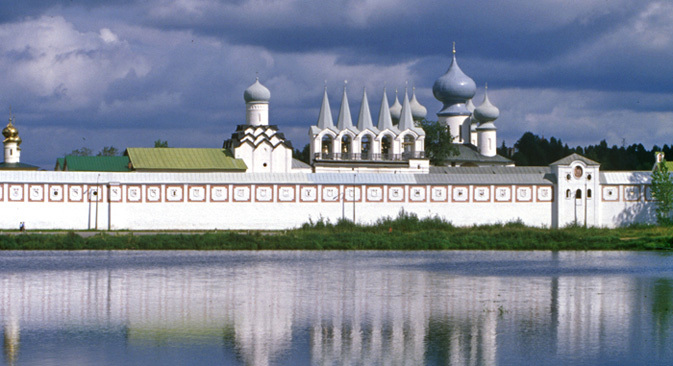 As prosperity gradually returned in the 17th century, Tikhvin and the Dormition Monastery benefited. Damaged by fires in the 1620s, the restored Dormition Cathedral gained a towering 6-level icon screen and its interior walls were newly painted with frescoes in the Yaroslavl style. Although the frescoes of the main space were repainted by Login Shustov in 1794-97, 17th-century frescoes have remained in the attached gallery, particularly along the south side with vivid depictions of the Apocalypse. By the turn of the 18th century, the population of Tikhvin was tired of being subservient to the monastery, and in 1723 Tikhvin was released from monastery governance and obligations. Fifty years later, it was granted formal status as a town. During the 19th century Tikhvin experienced modest growth in trade, transportation and cottage industries. A few houses and other buildings from the period have survived in the historic center, most notably the childhood home of the composer Nikolai Rimsky-Korsakov,who was born there in 1844. The house is now preserved as an attractive museum near the Tikhvinka River. In the 20th century Tikhvin shared the difficult fate of so much of Russia. As the German juggernaut threatened Leningrad in the fall of 1941, Tikhvin became the scene of desperate fighting. During the Tikhvin Defensive Operation (Oct. 16-Nov. 18) the Red Army prevented the enemy from completely surrounding Leningrad, but Tikhvin was seized on Nov. 8. The subsequent Tikhvin Offensive Operation (Nov. 10-Dec. 30) pushed the enemy back to the Volkhov River and reopened a forest road and spur rail line to Lake Ladoga. On Dec. 9, Tikhvin became one of the first towns to be liberated in the Soviet winter offensive of 1941. Even so, the few weeks of German occupation severely restricted the delivery of food and other supplies via Tikhvin and Lake Ladoga to Leningrad, which experienced catastrophic levels of starvation during the winter of 1941-42. The most momentous event so far in Tikhvin’s 21st century history occurred in 2004 with the return of the Tikhvin icon to the Dormition Monastery. The icon had been taken to Pskov during the German occupation and then evacuated through the port of Riga to Germany toward the end of the war. In 1950, it arrived at the Holy Trinity Orthodox Cathedral in Chicago under the care of Archbishop John (Garklavs; 1898-1982). His intention was for the icon to be returned when Russia was free from an atheist ideology. After much deliberation, this wish was implemented by his adopted son, Father Sergius Garklavs, actively supported by American and Russian Orthodox prelates. In the summer of 2004 the Tikhvin Theotokos Icon was transported with great solemnity via Riga, Moscow and St. Petersburg to the Tikhvin Dormition Cathedral. After six decades, the great treasure again found its place in the monastery that has been so closely linked to Tikhvin.